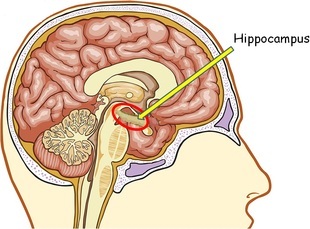 Hippocampus is a smooth, curved, elongated elevation of gray matter which is lying along the floor of inferior horn of lateral ventricle and it is only clearly observed when cavity of inferior horn of lateral ventricle is dissected out. Anterior expanded end presents a few shallow cleft giving the appearance of animal’s foot. That is why it is called pes hippocampus. Hippocampus itself is so named because in coronal section, it looks like a ‘sea-horse’. Convex ventricular surface lined with ependyma, when viewed on coronal section, presents in subependymal plane a thin layer of white matter called alveus. Alveus is formed by the fibers which converge medially after originating from the nerve cells of hippocampus. All the fibers of alveus turns further posteromedially to form a bundle called fimbria. The fimbria runs posteriorly to become continuous with posterior column of fornix. So, it is clear that axonal processes of neurons of hippocampus which first extend medially but finally posteriorly as alveus, fimbria and ultimately as posterior column of fornix. Posterior column of fornix curves round posterior end of thalamus. Hippocampus ends posteriorly below splenium of corpus callosum. It is so called because margin of this gyrus is serrated on denticulated. This narrow and notched gray matter also extends anteroposteriorly between fimbria of hippocampus and parahippocampal gyrus. Parahippocampal gyrus is positioned inferomedially. Dentate gyrus extends posteriorly parallel to fimbria. Turning round splenium of corpus callosum, dentate gyrus becomes continuous with a thin vestigial lamina of gray matter over superior surface of corpus callosum. This thin sheet of gray matter covering superior surface of corpus callosum is called indusium griseum. On the surface of this thin gray matter lamina on either side of middle there run a pair of thin thread-like band of white matter called medial and lateral longitudinal stria. Posterior end of dentate gyrus, below splenium, is known as splenial gyrus or gyrus fasciolaris, which in turn, is continuous as indusium griseum. Hippocampus comes directly in formations of floor of inferior horn of lateral ventricle, but parahippocampal gyrus is more superficial in position and positioned inferolateral to hippocampus. Two are separated by hippocampal fissure. On the lateral side, parahippocampal gyrus is separated from medial temporooccipital gyrus by collateral sulcus which produces an impression on inferior horn of lateral ventricle called collateral eminence. Collateral eminence forms a bulge on lateral part of floor of inferior horn lateral ventricle. Earlier, limbic system used to be termed as rhinencephalon because it was thought that it is only related to function of olfaction. But actually in human brain olfaction is related to only a small portion of limbic system. Major part of cerebral cortex is highly developed in man and characterized by six layers of neurons. This is called neocortex. But limbic area of cortex is phylogenetically older component of cortex which is called allocortex. It is made up of neurons of three layers occupying central part of cerebrum. Transitional zone between allocortex and neocortex is called juxta-allocortex where neuronal layer vary from three to six. Superficial molecular layer: It is made up of scattered nerve cells and nerve fibers. The neurons are smaller in size. Intermediate pyramidal layer: It is made up of many large sized pyramidal cells. Inner polymorphic layer: It is structurally similar to the polymorphic layer of neocortex. Dentate gyrus is also three layered. But it differs from structure of hippocampus by the fact that, intermediate layer is made up of granule cells instead of pyramidal cells. Neurons of the granular layer of dentate gyrus are small in size and round or oval in shape. Their axons terminate in neurons of pyramidal cell layer of hippocampus. Some of the fibers of granular layer may be directly continued as fibers of fimbria. Subiculum is the site of transition between six layered cortex of parahippocampal gyrus to three layered cortex of dentate gyrus and hippocampus.